The Mario Toy Company is hosting a Mini Toy Carnival. Pauline and Donkey Kong have teamed up to run a mini-arcade. It's up to you to build paths on the touch screen by twisting, dragging and sliding tiles around. 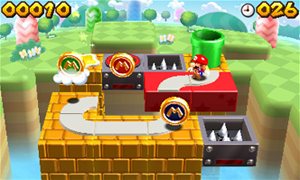 Lead the Mini Mario toys across the stage to the exit, collecting all of the M-Tokens on the way. There are four different play styles to take on, plus several minigames to try out. You can also build your own levels and share them online.